We woke up today at a normal time – Yay! After yesterday’s long walking around the Jardin des Plantes – several hours worth – we decided to “take it easy” today, which we’re enjoying. Tomorrow is our third wedding anniversary!! Nancy found all the emails from our wedding day, and we’re enjoying reading them again. Tomorrow is the actual day – hard to believe it’s really three years – time really does fly when we’re having fun. And we’re having lots of fun, on our SECOND honeymoon to Paris! Last year we were tourists. This year, we decided to try becoming short term residents. It’s a whole different experience. Even for this first week that is ending, our excursions and activities have not involved tourist activities, but learning how to get around, grocery shop, find the recycling bins, charge up electronic gizmos, use electrical appliances, get used to the apartment’s cooking tools, and enjoy parks and free concerts – not to mention getting back into some kind of circadian rhythm. We ran the dishwasher last evening – successfully. The apartment owner has gathered together a “manual” for tenants, containing the instruction manuals for all the major appliances. This is very helpful. So the dishwasher maneuver was rewarding. Now it was time to do our first load of laundry, in the tiny dual-function washer/dryer combined. Out came that manual – which wasn’t as simple as the dishwasher. We put in a load of dark clothes, and figured we’d do our first round of food shopping at a local street market as the washing machine was working. We took the grocery trolley – a handled bag on wheels – and set off down the street. We’d located last evening where the market was going to be: the stands were set up, although the canvas roofs were still rolled up. 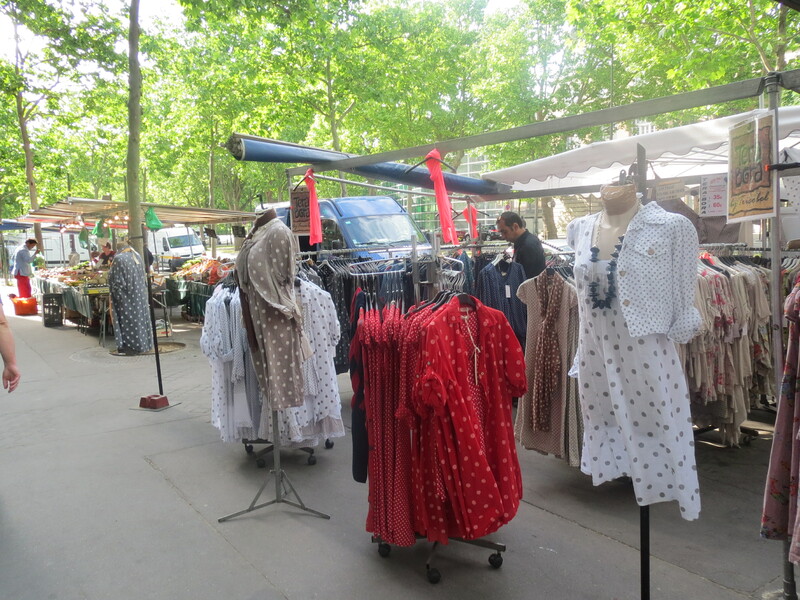 It was fun this morning to round the corner and see the stalls filled with food of different kinds, in addition to one dress stall. 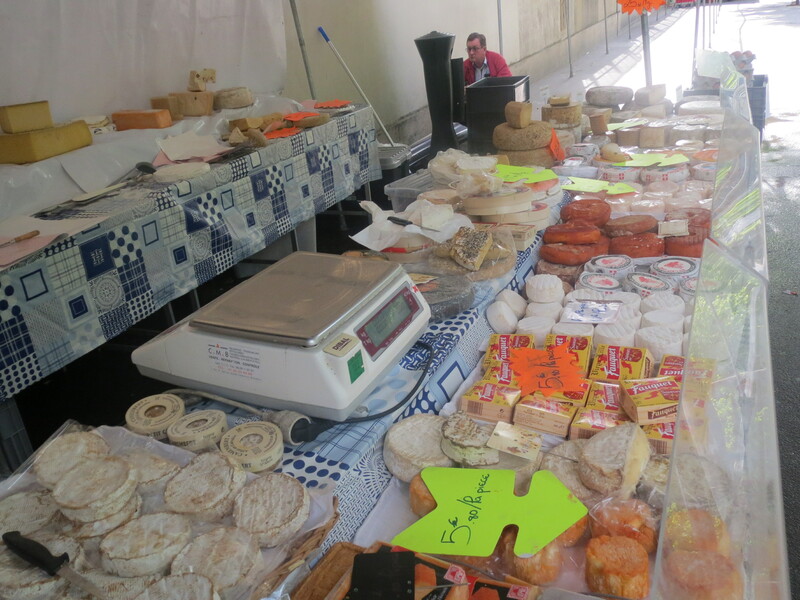 First, we walked the whole block length of the market, examining what was available on both sides of the sidewalk. Then we walked back, actually making our purchases as we went. We bought salad vegetables, farm fresh, to make a beautiful salad. And we got one of the awesomely sweet and flavorful, if small, melons that are nicknamed “Le fruit d’amour.” The “fromagerie” – cheese shop – had an amazing variety of fresh French cheeses – from cows, sheep, and goats — cured, hard, soft, enormous, tiny, pungent, sweet, blue, round, square, with and without rinds. Nancy had a hard time making up her mind, and finally counted out 3 mini-round cheeses at random, since the price was 3 for 5 Euros. The fish vendor had arranged whole fish of different sizes, colors, and varieties artistically, in groups or alone, and was shouting her wares and prices. Finally, we stopped at the Lebanese caterer’s stall to purchase prepared foods that would make a warm meal. On the way home, we stopped in at the Carrefour “super market” – no larger than a regular storefront, but packed, floor to ceiling, with an amazing variety of products of all kinds – to add bottles of water. It was to carry the water that we had brought the grocery trolley – Carrying several liters several blocks at the end of the arms is extraordinarily fatiguing – probably because we are not used to carrying groceries any further than from the cart to the car and from the car to the house. We actually had great fun food shopping this way. Eating the lunch we had purchased was also deeply satisfying. Somehow, food grown in France is dramatically richer in flavor than any fresh food I’ve eaten in the US – even what is produced by organic growers, which is several levels above industrially farmed foods in flavor (and, apparently, nutritional value). 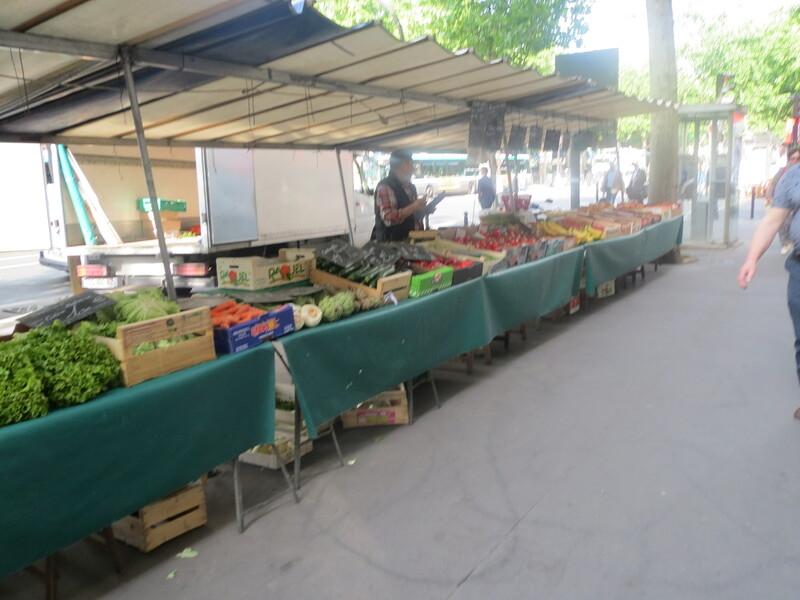 Food growers’ stalls on Boulevard de Port Royal, Paris, may 2014. 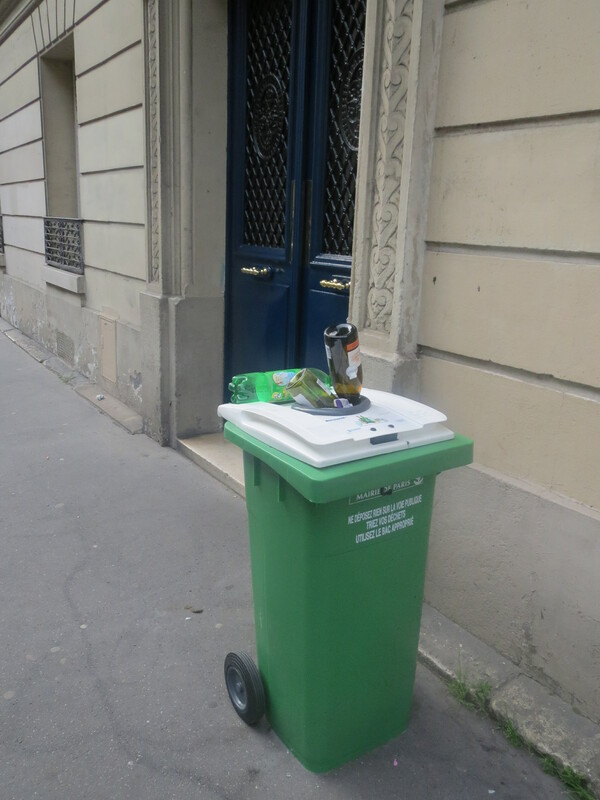 As we were returning down rue des Feuillantines to our apartment, we commented that when the glass recycling barrel that was put out last Wednesday, almost a week ago, finally gets picked up, we’ll no longer recognize which building is ours – the uncollected recycling container has become our landmark!